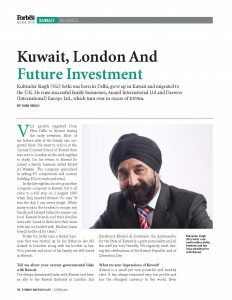 Kulvinder Singh (Vic) Sethi was born in Delhi, grew up in Kuwait and migrated to the U.K. He runs successful family businesses, Anand International Ltd and Daewoo (International) Europe Ltd., which turn over in excess of $100m. Vic’s parents migrated from New Delhi to Kuwait during the early seventies. Most of his father’s side of the family also migrated there. He went to school at the Carmel Convent School of Kuwait then was sent to London in the mid-eighties to study. On his return to Kuwait he joined a family business called Mohd Al Wazzan. The company specialised in selling PC components and custom building PCs in trade and retail. Today Vic Sethi runs a family business that was started up by his father-in-law Mr Anand in Leicester along with his brother in law. Vic’s parents and most of his family are still based in Kuwait. Tell me about your current governmental links with Kuwait. I’ve always maintained links with Kuwait and been an ally to the Kuwait Embassy in London. His Excellency Khaled Al-Duwaisan, the Ambassador for the State of Kuwait is a great personality and all the staff are very friendly. We regularly meet during the celebrations of the Kuwait Republic and of Liberation Day. What are your impressions of Kuwait? Kuwait is a small yet very powerful and wealthy state. It has always remained very low profile and has the strongest currency in the world. Even during the invasion, the Kuwaiti government in exile made sure that the currency maintained its strong position. There is a lot Kuwait offers to its residents and that is why many do not want to move out. It offers free medical support and is tax free. The people of Kuwait have always supported successful expatriates by making them business partners or offering them high posts such as general managers, etc. Kuwait also supports a number of charities nationally and internationally but keeps the work low profile. This includes educating children in undeveloped countries. How do you feel about the current investment climate? over the past 10 years to more than $24bn. At the end of 2013, the St Martin Property Corporation, which is controlled by the State of Kuwait, bought back a plot of land between Tooley Street and the River Thames in London that it sold 15 years ago. In 1983, the St Martin Property Corporation, which had turned the former Hay’s Wharf into London Bridge City that included the Cottons Centre and Hay’s Galleria, sold the undeveloped Eastern part of the site to London Bridge holdings, which was said to be around a 13-acre plot. This plot was redeveloped to create the More London estate that consisted of offices, shops and buildings that included the Mayor of London and the London Assembly’s headquarters. Today More London is a great development of properties, a home to some of the wealthiest tenants from both private and public sectors. Reuters reported that St Martin Property Corporation paid approximately $2.4 billion for the estate, which means that the State of Kuwait is a permanent landlord to the seat of London’s government. HRH Sheikh Dr Meshaal Al-Jaber Al-Ahmed Al-Sabah, the Director General of Kuwait Direct Investment Promotion Authority told me that he is working on a 100% Foreign Direct Investment scheme where the 100% foreign direct investor in Kuwait will not require a sponsor, but will actually become an acting sponsor and bring in a workforce based on the type of business it is. This has never happened before. What can you tell me about the thinking of the cabinet and His Highness the Emir of Kuwait? 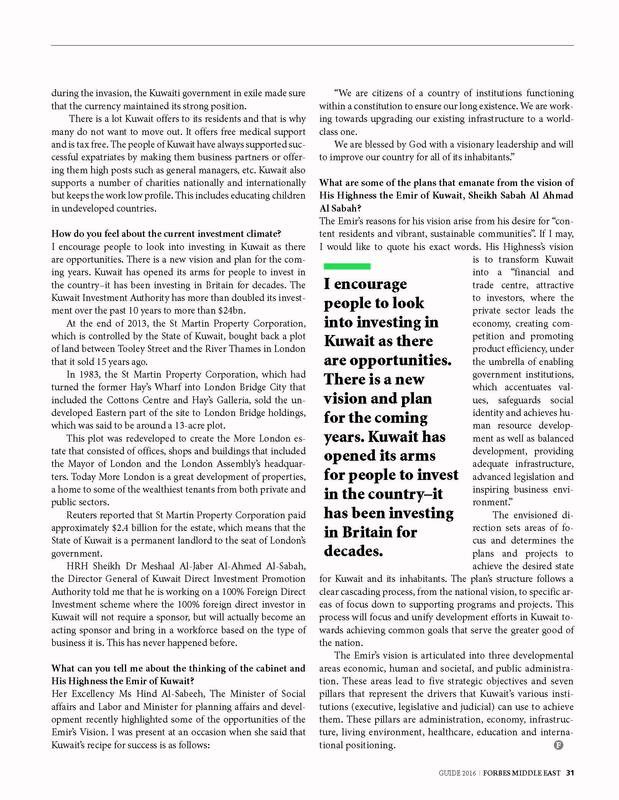 I encourage people to look into investing in Kuwait as there are opportunities. There is a new vision and plan for the coming years. 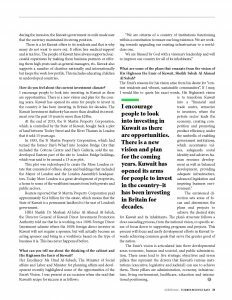 Kuwait has opened its arms for people to invest in the country–it has been investing in Britain for decades. What are some of the plans that emanate from the vision of His Highness the Emir of Kuwait, Sheikh Sabah Al Ahmad Al Sabah? The envisioned direction sets areas of focus and determines the plans and projects to achieve the desired state for Kuwait and its inhabitants. The plan’s structure follows a clear cascading process, from the national vision, to specific areas of focus down to supporting programs and projects. This process will focus and unify development efforts in Kuwait towards achieving common goals that serve the greater good of the nation. The Emir’s vision is articulated into three developmental areas economic, human and societal, and public administration. These areas lead to five strategic objectives and seven pillars that represent the drivers that Kuwait’s various institutions (executive, legislative and judicial) can use to achieve them. These pillars are administration, economy, infrastructure, living environment, healthcare, education and international positioning.